Local committee (in alphabetical order): Nerea Calvillo, Miquel Domènech, Daniel López, Vincenzo Pavone, Carmen Romero-Bachiller, Israel Rodríguez Giralt, Tomás Sánchez Criado, Francisco Tirado. The joint 2016 4S/EASST conference in Barcelona will be an opportunity to share reflections, ideas, findings and projects on a variety of aspects characterizing these alternative ways to do science and technology: (a) such as the fact that, for instance, all of these transformations usually take place in blurred everyday spaces and not in those enclosed established spaces for science and technology development, such as laboratories or industrial R&D departments; (b) or, in a similar way, the fact that research and innovation processes are increasingly organised in networked, horizontal assemblages where the traditional hierarchies in science are put into question and where science and technology are being co-produced by different actors in different, sometimes antagonistic, ways; (c) and, finally, the fact that traditional boundaries between the public and the private are no longer confined to state and for-profit actors, care practices taking a preeminent presence in most of these everyday situations. This is the first international edition of the STS Summer School, regularly held since year 2000 for Plovdiv University’s B.A. sociology students specializing on ‘Science, Technology and Innovation’. STS International Summer School at Plovdiv (STS_ISSP) aims to introduce students to the modern science and technology as form of life and identification. It helps students to develop basic skills in applying STS knowledge to the study of research and engineering practices in particular scientific organizations. 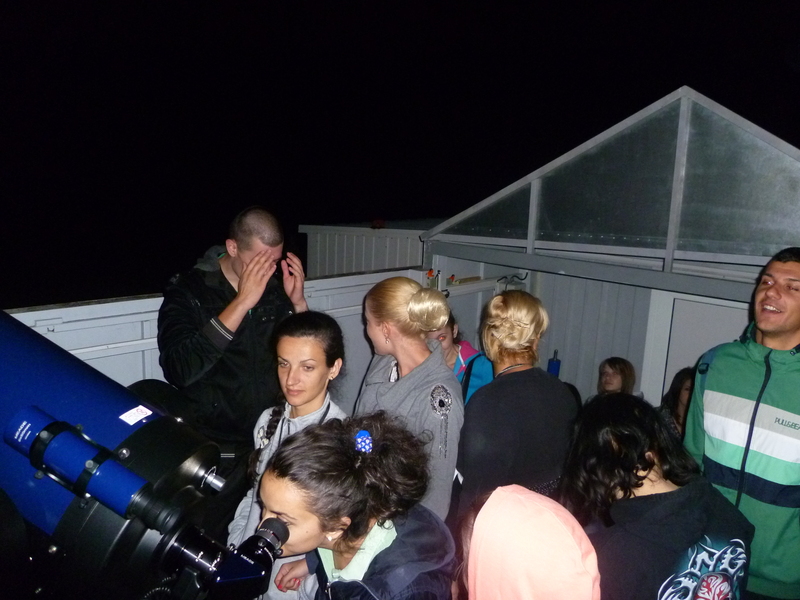 The students will spend a week in the research community of the astronomers and supporting engineering staff at NAO Rozhen – the biggest astronomical site in South-Eastern Europe. They will be attached in small groups of two or three to particular researchers and will observe their daily work, taking interviews, analyzing documents and technical artifacts, and collecting photo and video data. Special attention will be paid to practical application and use of semiotics in the analysis of collected data. During the stay part of the students will study also a high mountain dam in the region, taking interviews and observing of everyday life of technical staff at this large technical system. In 2015 sixteen Bulgarian B.A. sociology students will take part in STS_ISSP, together with twelve anthropology students from Laboratory for Social and Anthropological Research Tomsk State University, Russia whose travel expenses were supported by the project “Man in a Changing World. Problems of Identity and Social Adaptation in History and at Present” (the RF Government grant No. 14.B25.31.0009). Additional outputs will be preparing documentary film about practice of astronomers and engineers and fieldwork itself of anthropologists and sociologists. EASST grant helped organizers to develop the now traditional STS Summer School for Plovdiv University sociology students into an international event. After the World War II Bulgaria was one of most rapidly industrialized among the former communist countries and it managed to preserve most of its scientific and industrial base during the post-socialist period. It is our aim to make STS_ISSP regular, bringing each year STS students and researchers to study remarkable scientific and technology sites in Bulgaria – unique high mountain dams, and possibly other countries in South-Eastern Europe. Accommodation, meals and travel expenses (for attending cultural events) will be covered by the STS-ISSP. Participants cover the travel costs to Plovdiv, Bulgaria by themselves. The participation fee is 240 euro paid upon arrival and registration in Plovdiv. Best Projects Award – The best research reports will be published in volume. Applicants should send a CV and a 500 words motivation letter till the end of April each year to sts_issp@uni-plovdiv.net. The successful applicants will be informed until May 10. Those approved who need visa will receive letters of invitation.